Rare WWII German poison ring used by high-ranking officer or government official. Ring was made from silver 835. Diameter 19 mm, Size 20 mm, Weight 17,2 g.
The top of the ring has a crescent shape 18K yellow gold section surrounding a ruby. There are silver lizards on each side of the ring. This ring is engraved in German: "ich atme tief und ohne Angst"/ "I breath deeply & do not fear". The ring is used to store poison or hypnagogue. TRIXUM: Mobil-optimierte Auktionsvorlagen und Bilder-Hosting. 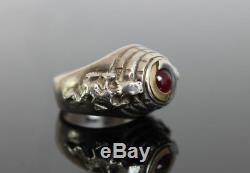 The item "Original WWII German Officer Poison Ring" is in sale since Friday, April 27, 2018. This item is in the category "Collectibles\Militaria\WW II (1939-45)\Original Period Items\Germany\Personal, Field Gear". The seller is "panzer-grenadier-85" and is located in Gdansk.